A small piece of home can go a long way. The first day of school often elicits a host of emotions for a child, a parent and even a teacher. When I used to work in the school setting as a therapist, I remembered going out to a car with an angry and anxious student whom refused to go in to the school on his first day. As I started to speak to the student, the parent took out a $100 dollar bill and placed it in the visor above his seat. She told him it was his if he attended school. He looked at it, looked at his mother, looked at me, then grabbed the money and ran into the building. The mother drove off without a comment. Dealing with school anxiety can twist our original ideas of parenting and attempts at managing our child’s behavior. I found out later the family had argued all morning about going to school. It was the first discussion about school all summer! A child’s aversion to the first day of school or even the first couple of weeks is quite typical. Whether it’s a learning disability, ADHD, social anxiety or less symptomatic like being tired or attached to their swimming pool, going back to school is a transition; a change. Start The School Routine Early – A week or so before school start building your child’s routine. This includes the time they wake up, the breakfast they will eat, and even what responsibilities they may have (e.g. backpack, lunchbag). Start practicing and change their internal sleep clocks from summer to fall. Be Specific About Anxiety – Speak directly to what makes them nervous. First, start with phrases such as “it’s typical to be nervous about going back to school” or “it’s okay to be a little scared, most of the kids are experiencing the same thing”. Immediate statements that there’s little to worry about, it’ll be fine and what’s the big deal often create a home environment that is not safe to express negative feelings. Reassurance has its place but not right away and not all the time. Visit the School – Especially if it’s a new teacher, new room, new transition schedule or a new building. Change is tough but experiencing some of the change in advance may help them quell their fears. Most schools offer a open house or orientation but you may also contact them about just stopping by once and meeting the teacher in a less formal setting. Remind Them of Success – Recount a story to your child when they have overcome their fears or walked through their worry. Remind them of the “other side” and how it was more calm and clear then they predicted. Encourage their strength and determination during the brief struggle. A child’s memory can be reactivated through these real stories. 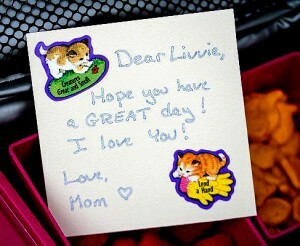 Give Them a Piece of Home – Send a hand-written note or drawing in their backpack and/or lunch bag. Put their favorite snack in there for the bus ride. The younger ones often enjoy a picture of their mom, dad, or favorite pet. These comforting associations adjust their viewpoint and build safety upon their return. Stay Calm and Know It Gets Better – Anxiety naturally subsides over time. Stay calm as a way to model how to handle change. Hopefully, with the above steps and your stable love and affection, their school anxiety will lessen each moment of each day and within a few weeks may be gone all together. Keep your expectations moderate for the first few weeks to ease the pressure, then as they get comfortable increase your hopes. There may be times when a child’s school anxiety is more intense and may need additional support and encouragement. Come talk to a trusted, empathic, well-trained therapist at New Directions Counseling Services to help you navigate the first few months of school.